Description of "3 Simple Steps to Manage Domestic Finance (eBook)"
This is practically a hand book that looks at the intricacies of managing domestic finances. It examines the issues from a Biblical point of view. Every Christian family should and must understand the steps outlined to live a blessed life. Mickey Douglas hails from the north eastern state of Assam in the Indian sub-continent Married with two children, he is a Soft Skill trainer by profession and has a passion for writing. The efforts through his brief and compelling books are to share certain Christian developmental principles which are Biblical in nature but have stood the test of time! 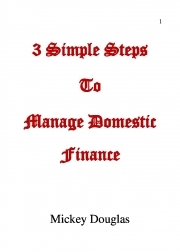 Reviews of "3 Simple Steps to Manage Domestic Finance (eBook)"